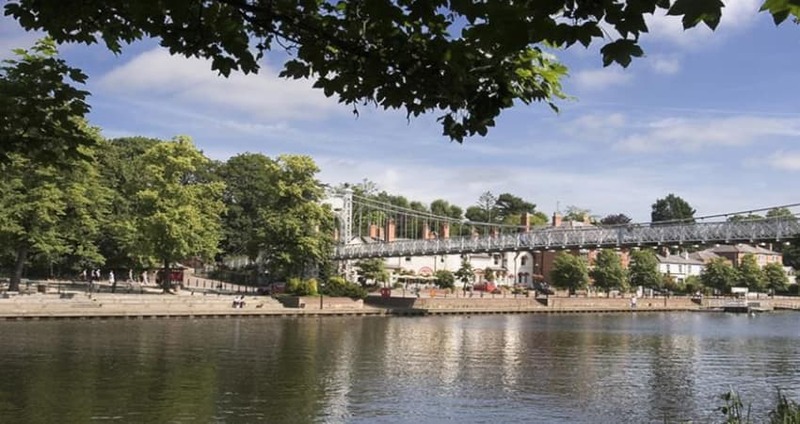 A cruise on the River Dee in Chester is one of the most relaxing things you can do in the city. Cruises can be half an hour long or more. There is a lot to see and do along this river with its rich history and you will thoroughly enjoy yourself. This is a riverside promenade that attracts both locals and tourists in huge numbers. It was set up in two stages. Charles Coroughton laid down the first section in 1725. Alderman Charles Brown laid down the other section, on the western end near the Old Dee Bridge in 1880 to 1881. Nearby, there are pubs and refreshment kiosks. There are also landing stages where pleasure boats depart for cruises along the river. These steps are just a short distance from The Grooves. The steps are arranged in steps of three and are called the Wishing Steps. They were built in 1785 and they link the different levels of the east and south walls. The bridge is one of the two footbridges used to cross the river. The bridge was built in 1923 and restored in 1998 and 2012. Despite various warnings by city authorities, youngsters often throw themselves off the bridge into the cool deep waters. The park was radically renovated in 1944. Richard the Second Marques of Westminster donated the 20 acres on which the park is located in 1867. He wrote a letter to the council indicating that this was his gift to the residents of Chester. Richard hoped that it would afford them a place of recreation for many years in the future. The Marquess also paid for the designing and laying out the new park by Edward Kemp, who was a pupil of Sir Joseph Paxton who designed the Crystal Palace, located in London and the Birkenhead Park. Kemp was a renowned garden designer of parks. His other works include Newsham and Stanley Parks, Liverpool, Hesketh Park, Southport, and Queen’s Park in Crewe. In 1845, Joseph Paxton was appointed to be the superintendent of the Birkenhead Park. Grosvenor Park was originally an agriculture land called The Headlands. The opening of the Park was accompanied by one of the biggest processions ever seen in Chester, which was over a mile long. The Park is today considered one of the finest examples of Victorian Parks in North West England. Although many changes have been made since its launch, much of Kemp’s original design can still be seen. Visitors to the park will notice that there are huge numbers of squirrels inside the park. It is believed that this is the first in the UK where grey squirrels were introduced. At the time, Grey Squirrels, which came from the USA, were thought to make a nice decoration. No one had estimated how successfully the creatures would thrive. They also had quite devastating effects on the red squirrel population. Once you leave Grosvenor Park and cross the suspension bridge, you will be near The Meadows. This is a huge and beautiful area of wetlands and grass, which borders the river. You will find cattle grazing, which is a surprising site so close to the city. The locals love the Meadows and cattle. However, city planners have threatened them in the past. This was especially so when Manchester submitted a bid to host the Olympic Games of 1996. The plan was to replace The Meadows with grandstands, a car park, and cafes. The populace flat out rejected the proposal and the idea was abandoned after the failed bid by Manchester. The Brown Family donated The Meadows to the city in 1960. The only condition was that they would always be open to the people of Chester for all time. Thus, most locals felt the council had no right to convert them into anything else. The outdoor swimming pool may not have materialised but in 1849, a wash house and swimming baths had been created near the Water tower. In 1883, they were replaced with the Floating Baths. The bathhouse was moored near the Bridgegate in the River Dee. The idea of creating a floating was first proposed in 1874. However, it stalled due to arguments about its location. The first site was under the suspension bridge, but this was rejected. For one, it would cause a nuisance. Additionally, the Bishop of Chester, whose place overlooked the Groves did not want the structure under his gardens out of fear his kids would see it. Upon completion, the floating bath was opened daily in summer for 6 AM to 9 PM. There were separate sessions for the ladies and season tickets were sold for five shillings. The structure was set at an incline. As a result, the deep end was six and a half feet while the shallow end was 3 feet. The changing rooms were located on the decked pontoons. They were roofed by canvas awning. However, the pool was open to the sky. River water entered the bath via holes, which often admitted mud as well. The holes were later enlarged to allow more water through, which helped deal with the mud problem. However, the baths were still not comfortable as there was no hot water or bath facility. Later on, in 1895, the city commissioned John Douglas to design new City Baths in Union Street. The baths opened in 1901 and it is still working up to date. This sealed the fate of the floating baths. In 1899, a strong tide made the floating bath break loose. IT was caught up in the weir but was later restored and returned to service. However, it was later broken up and sold to Dobbin, a scrap merchant. It was sold for twenty pounds, a lot of money back then. If you look across the river during a cruise, you might be lucky to see a huge building which somewhat looks like a Greek temple. The building was created in 1938 to 1939. It was used as the army HQ for the Western command. The Western command was the region starting from Hadrian’s Wall near the Scottish border up to Tewkesbury in Gloucestershire. The building was first occupied by the Western 1938. In 1972, the building was taken over by the Royal Army Pay Corps until the Defence Ministry closed it down in 1997. During its construction in the 1930s, it provided a lot of work to hundreds of locals of various trades. Most of these were men who were past the call-up age. As the war heated up in 1939, labourers worked fast to excavate a crater into the mountainside. The army moved into the building as sections were being completed. The plumbing, offices and the air condition was duplicated underground in case the building above ground was bombed. It was camouflaged in 1941 with a dark grey wash to ensure it could not be seen from above ground. The building was the site of secret meetings between Eisenhower, General de Gaulle, and Winston Churchill in 1943 and 1944. In 1997, the building was sold to North West Securities to be used as their Chester head Office. A new block was added and the height was increased. With time, the bank evolved to become what is known as the Halifax Bank of Scotland. However, the bank later abandoned the buildings. There have been various plans put forth, including using it as a hotel. However, the current front-runner is pulling it down and erecting luxury housing. The museum is located just a short distance from the River Dee. It is located in the former barrack block of Chester Castle. It was designed by Thomas Harrison and completed in 1810. It is an important Grade 1 listed complex. Nikolas Pevsner, an architectural critic claimed that this was amongst the most powerful monuments for Greek revival in the UK. The museum is home to objects related to soldiers in Cheshire. It focuses on Regiments associated with Chester city. This includes the Cheshire Regiment, 5th Royal Inniskillling Dragoon Guards, 3rd Carabiniers, and the Cheshire Yeomanry. This also includes a wide array of World and general British military history beginning in the seventeenth century to date. Items here are organisational as well as personal ones. Oil paintings here vary widely in age and quality. They depict soldiers, their families, battle scenes, ceremonial occasions, and much more. During your boat cruise, you will have a chance to see the Chester City Walls. The walls were constructed for defence purposes, which was first started by the Romans. This was after they built the fortress of Deva Victrix from 70 to 80 AD. The first walls were ramparts of earth and turf. From 100 AD, they were made using sandstone. However, construction was only completed 100 years later. After that, nothing was known about the walls until Chester was refounded in 907. After Norman Conquest, the walls were extended to the south and west to engulf the entire medieval city. Maintenance was an on-going concern and just before the Civil War, they were fortified. However, they suffered damage. After that, their purpose for the defence was abandoned and rebuilding was done only for purposes of beauty. These walls are a major attraction and you can view them along the River Dee. These gardens are quite close to the River Dee. The gardens stand just to the southeast of Chester City. Graham Webster constructed the gardens in 1949. The aim was to display building fragments from the Roman Fortress of Deva. Here you will find pieces from some important military buildings, the legionary headquarters, and the baths. Most of the artefacts found here were unearthed during the late nineteenth century via a series of excavations all over Chester. It was Chester’s contribution to the Festival of Britain in 1951. Here you will find columns from the exercise hall of the Roman bathhouse that stood six feet tall and supported the stonework. You can also view a reconstructed hypocaust and mosaic in the gardens. The hypocaust was a Roman heating system that was used to circulate air under the floor of the building. In 2000, the gardens were remodelled to offer access to the River Dee. There are information panels set amongst attractive planting. They offer details to visitors on the Roman era and the garden. Inside the gardens, the Chester Civic Trust commissioned Gary Drostle to install three mosaics for these gardens. To access the gardens from the River Dee, you have to go through the Groves. You may also go through Little St John Street if you are in the city, just near New Gate on the City Walls. From the Newgate entrance across the road, there are the remains of the Angle Tower, which once formed part of the wall constructed by the Romans. One of the best pre-conquest churches in England, it is an impressive Normans church that was created in AD 689 by the King of Mercia. The site of the church was most likely a shrine or church building. In 907 AD, the church was expanded. In 1075, the church was raised to the status of a cathedral in the West Mercia region. In the 13th century, the church became a Collegiate Church of Chester. A college of secular canons maintained it. When Henry VIII established the See of Chester in 1541, the bishop there established his seat at St. John’s. The interior of the church is Normans and can be dated to the 12th century. It is a great example of Britain’s transition from Romanesque to Gothic style. The organ here is worth noting. It was originally at Westminster Abbey where it was present during the 1838 coronation of Queen Victoria. The River Dee and Chester City are steeped in history. It has a story to tell from almost all recorded history of Britain. If you are looking for a place to enjoy a boat cruise and enjoy some history, you should visit the River Dee.